If you are a member of JASNA you are welcome to attend all of our meetings and special events. If you are not a member, you may come to a few of our meetings before joining the Society. Information on how to join JASNA is available on the JASNA Membership Page. Check this page periodically for updated information about our Region's activities. Southern Arizona Region members will receive email notices of upcoming events as well as last minute changes or cancellations. All meetings are held in Tucson unless otherwise specified. Meetings are held in Tucson unless otherwise specified. Questions? Please contact Melita at janesmeetingmayhem@gmail.com. Join us as we plan our Region's programs for the coming year. Join us in a lively discussion and comparison of the different types of proposals in Jane Austen's novels. Visit our booth to "Talk Jane" and learn more about the Jane Austen Society of North America and our Region. We'll explore several aspects of Jane Austen's writing through a series of short, informative and entertaining videos by Dr. John Mullan. Mullan is Professor of English at University College in London and was the keynote speaker at JASNA's 2018 Annual General Meeting. JASNA Past President Iris Lutz will present an illustrated talk on houses in Jane Austen’s real and imagined worlds. The visual tour will feature houses she lived in and visited in Chawton, Bath, Winchester, and Kent and will examine what she may have had in mind when she created Barton Cottage, Pemberley, Sotherton, and Donwell Abbey. 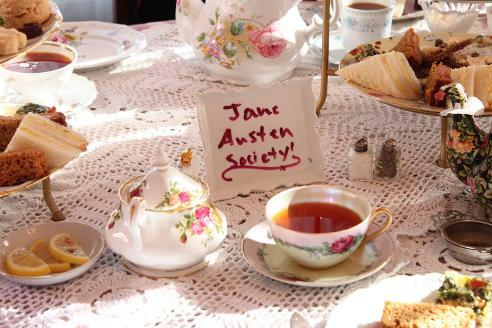 We are planning two days of Janeite fun: Austen-related movies, presentations, games, and more. Stay tuned for details. Join us for a lively discussion of Austen's entertaining parody of the Gothic Novel, published 200 years ago. We'll gather to share an Emma-inspired pot-luck "picnic" and our thoughts on Ann Radcliffe's Gothic novel The Mysteries of Udolpho. The book is mentioned often in Northanger Abbey as the impressionable Catherine Morland's favorite novel. Jane Austen once wrote that she and her friend Martha Lloyd were "desperate walkers." Her heroines also enjoyed country walks --most notably, Elizabeth Bennet. With that in mind, Region members and friends are invited to walk with a purpose in Tucson's "Walk to End Alzheimers." We feel Jane and Elizabeth would approve! Join us as we celebrate Jane Austen's 244th birthday with a special luncheon and program. Details will be available later this year, and advance registration will be required.